Fire restrictions are now in effect at this park. Wood, charcoal, and propane fires are prohibited. Gas and propane stoves are allowed for cooking meals only. Smoking (including e-cigarettes) is prohibited in the park and on trails. Smoking is allowed inside an enclosed vehicle/camper only. Please contact the park at (480) 982-4485 for more information. 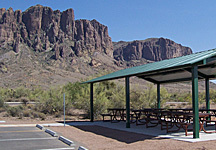 Facilities available at Lost Dutchman State Park. 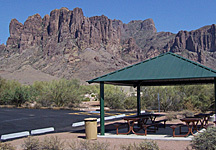 The Lost Dutchman Visitor Center includes a park store. Restrooms are located inside. The park is open 365 days a year. Two accessible bathrooms are located in the Cholla and Saguaro day use areas. There are also two restroom/showers buildings buildings located in the campground. Books, maps, and souvenirs are available in the gift shop, located in the Visitor Center. Brochures on local attractions are also available. Visa and Mastercard are accepted. A few exhibits are located in the Visitor Center. The Cholla Group ramada can be reserved up to 12 months in advance. It has 4 tables under a large roof with lights, electricity, nearby water spigot, group grill and a fire pit. A non-refundable $5.00 reservation fee and a $25 facility use fee applies to use the ramada. All vehicles must pay the day use entry fee. 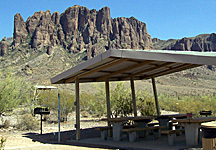 The ramada area has superb views of the nearby Superstition Mountains. The Saguaro Group ramada can be reserved up to 12 months in advance. It has four tables under a large roof with lights, electricity, water spigot, group grill and a fire pit. A non-refundable $5.00 reservation fee and a $25 facility use fee applies to use the ramada. All vehicles must pay the day use entry fee. 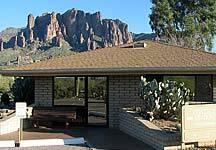 The ramada area has views of the Superstition Mountains as well as overlooking the Mesa and Phoenix skyline area. The Palo Verde Group ramada can be reserved up to 12 months in advance. It has 8 tables under a large roof with lights, electricity, water spigot, and group grill. A non-refundable $5.00 reservation fee and a $25 facility use fee applies to use the ramada. All vehicles must pay the day use entry fee. 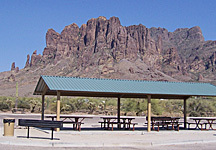 The ramada area has spectacular views of the Superstition Mountains. There are now three separate group camping areas available. Please call the park directly for group camp information at (480) 982-4485. All group camps require a non-refundable $5.00 reservation fee and a $25 per night facility use fee to reserve the area. All vehicles must pay a nightly camping fee. Groups are encouraged to look over the area for suitability prior to making a reservation. Quail Group Camp area has a 12 vehicle/RV minimum to reserve; it can accommodate up to 35 RVs or 50+ cars. The ramada has several tables underneath, lights, an electric outlet and a water spigot, group grill, fire pit, and is located near a restroom/shower building. Road Runner Group Camp is strictly for tent groups and has a 5 vehicle minimum and can accommodate a maximum of 12 vehicles. The ramada has several tables underneath, lights, an electric outlet and a water spigot, group grill, fire pit, and is located near a restroom/shower building. This area is not for RVs or travel trailers. Hummingbird Group Camp is strictly for tent groups and has a 3 vehicle minimum and has a maximum of 6 parking spaces. Open tent area is 30' x 40', 200' to parking area, 650' to restrooms/showers, picnic tables, fire pit, water, and an electric outlet at site. Use of dump station is free for registered campers. Non-registered campers may use the dump station with paid fee. Two shower buildings are available for registered campers year-round. 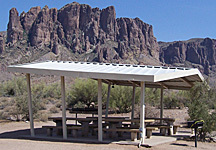 Thirteen single shaded ramadas with tables, grills are available for picnics. Restrooms and drinking fountains are located nearby. 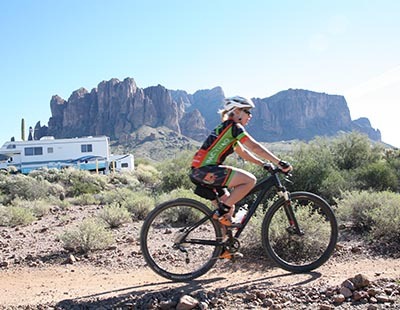 The park has four miles of mountain bike singletrack at the foot of Superstition Mountain. 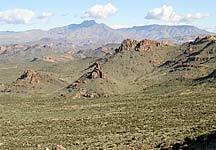 This winding loop trail — rated beginner to intermediate — traverses the Sonoran Desert across rocky terrain and sandy washes. 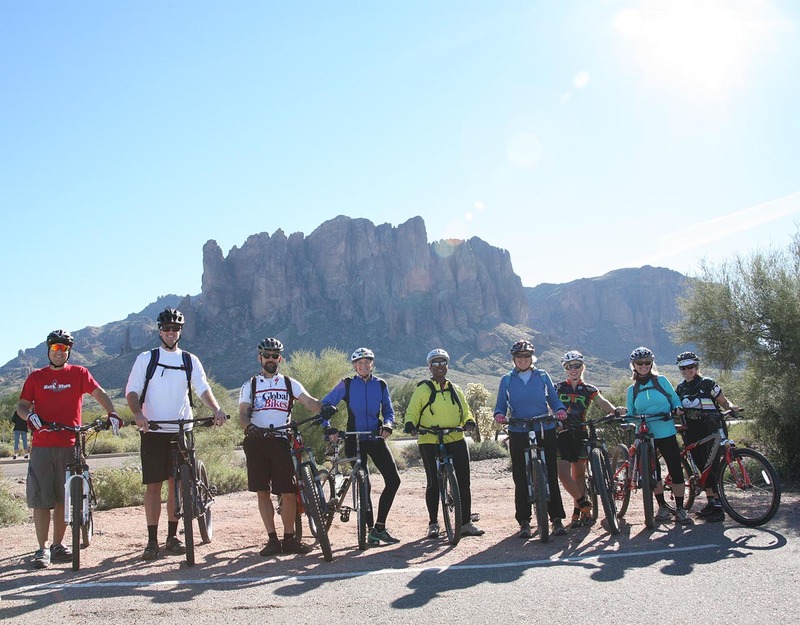 Ride between giant Saguaros among Palo Verde and Mesquite trees and bask in the solitude, just a short 30 minute drive from the Phoenix Metro area. Bikes can also use the multi-use trails in the Tonto National Forest, which are easily accessed from the park. However, bikes are not allowed beyond the Wilderness Boundary on the Siphon Draw Trail. In addition, a 1/2 mile hard-packed granite trail leads from the Campground to the Ranger Station. A large variety of other interesting Arizona wildlife species can be found within the park and offer year-round wildlife viewing opportunities. Mammals of interest include mule deer, coyote, javelina, bobcat, and jackrabbit. Most desert animals are nocturnal, so early morning and late evening viewing are best. Any of the park trails offer good opportunities for birdwatching and wildlife viewing. Fires in metal grills only! No wood collecting in park. Keep pets on leash. Please pick up after pets. All vehicles to remain on pavement at campsites. There is a 14 night stay limit in campgrounds. Quiet hours are 9 p.m. to 8 a.m. Generator hours are 8-10 a.m. and 5-7 p.m. Please use caution when hiking. Those planning to use the longer trails should carry a topographic map. Each person should carry at least one gallon of drinking water per day and wear proper footwear. Remember summer temperatures often exceed 100° F.
Day Use hikers must park in the day use area. No parking on roads, campsites, or by shower building. For your own safety stay on designated trails and stay out of old mine shafts. Be watchful for changing weather conditions. When hiking alone, leave a note on your vehicle or let someone know where you are going. No motorized vehicles are allowed on trails. Report any problems to a park ranger.